KANSAS CITY, Mo. — A University of Missouri-Kansas City student was arrested Thursday and now faces three charges, including assault, in conjunction with the on-campus protest of conservative political commentator’s appearance. Gerard G. Dabu, 23, was charged Friday with assault, destruction of property, and disturbing schools of other lawful assemblies. He has been released on bond, according to a statement from UMKC. 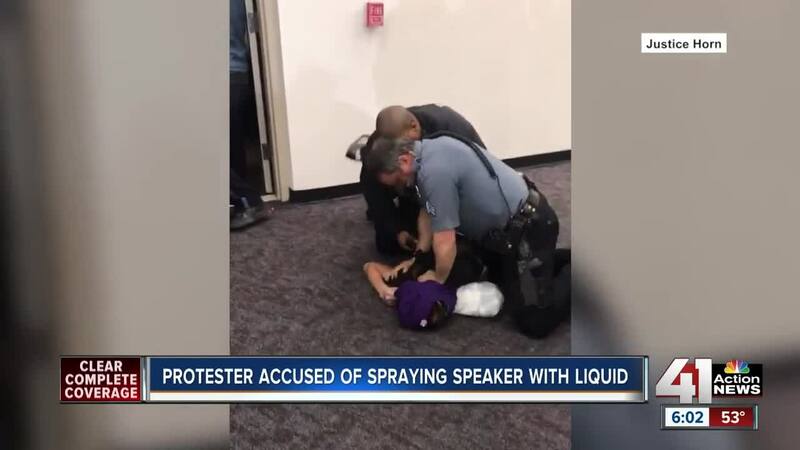 Dabu allegedly sprayed “an unknown chemical substance from a water gun” on two UMKC police officers “causing burns to their body,” according to reports filed in Kansas City, Missouri, Municipal Court. The destruction of property charge stems from damage to the officers’ uniforms. It’s the latest fallout from the protest of Michael Knowles’ speech Thursday at UMKC’s Royall Hall. “The evening’s events (Thursday) laid bare deep divisions that exist in our society today — divisions that UMKC works diligently to address through education, support and commitment to our values,” the school said in a statement. “UMKC must maintain a safe environment in which all points of view, even extreme ones, are allowed to be heard,” Agrawal said in the email. The school has a launched a separate campus disciplinary investigation, but Agrawal reiterated an “absolute commitment to diversity, equity, inclusion and the equal rights of members of the LGBTQ community” among three primary takeaways from the incident. Agrawal also reaffirmed UMKC's commitment to protecting First Amendment rights, even when opinions expressed are “controversial and unpopular,” as a taxpayer-funded university and its expectation that the free exchange of ideas be conducted in a respectful manner in accordance with the school’s Statement of Values .